This service is designed to aid your relationship or marriage with more stability, strength, passion, communication and emotional health. It can also increase the chance of a proposal and strengthen the commitment and health of an already serious relationship. This listing is for a 7 day service, which will be customized with your photos, dates of birth, full names and information specific to your situation and goals. 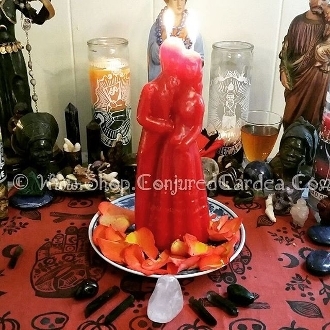 You can add a layered affect to this service by using my Love Haunt items on an appropriate gender, red figure candle.